A sudden gush of blood from your nose looks nothing less than a scene straight out of a horror flick. As unnerving as it may be, occasional nosebleeds are nothing to fret about. It’s only the dramatic mess involved with a pool of blood that makes people panic. Nosebleed, medically known as epistaxis, happens when one of the numerous blood vessels that line your inner nose bursts. A nosebleed can be anterior (occurs from a blood vessel toward the front of the nose) or posterior (occurs in the rear part of the nose). The latter is more dangerous, as the blood can drain back into the throat, causing you to choke or vomit. Before we delve into how to stop a nosebleed, it is essential to know what can cause it and how you can prevent one. 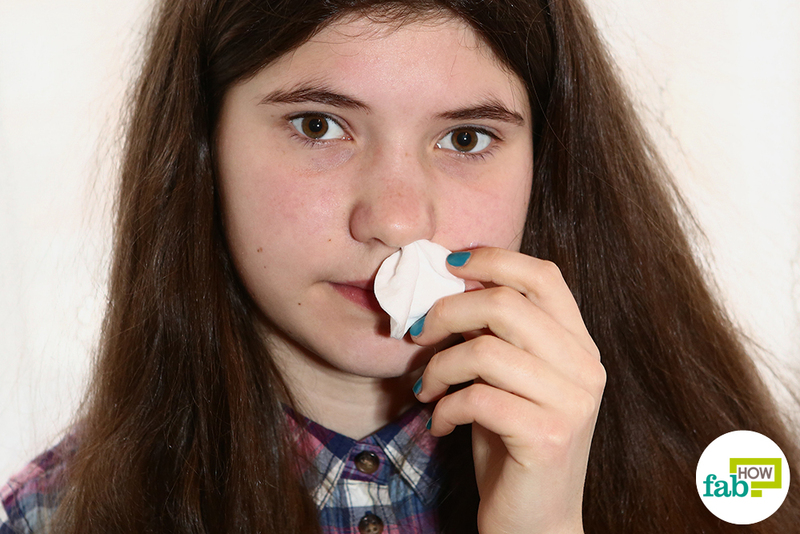 Can Nosebleed Indicate a Serious Health Issue? If you recently had a nosebleed or suffer from them frequently, following these preventive measures can help prevent future bouts. Use a humidifier in your home when the air is too cold or dry. Drink plenty of water to stay hydrated and/or use a saline nasal gel to keep the mucous membranes moist. Avoid picking your nose to avoid injury. Avoid lifting anything heavy or doing any strenuous activity in the first 48 hours after a nosebleed. Excessive pressure on the body can rupture the blood vessels. Keep your head elevated using pillows when you go to sleep. Avoid smoking, as it can irritate your nasal cavity and make it dry. Avoid taking any anti-inflammatory or blood-thinning medication after having a nosebleed. 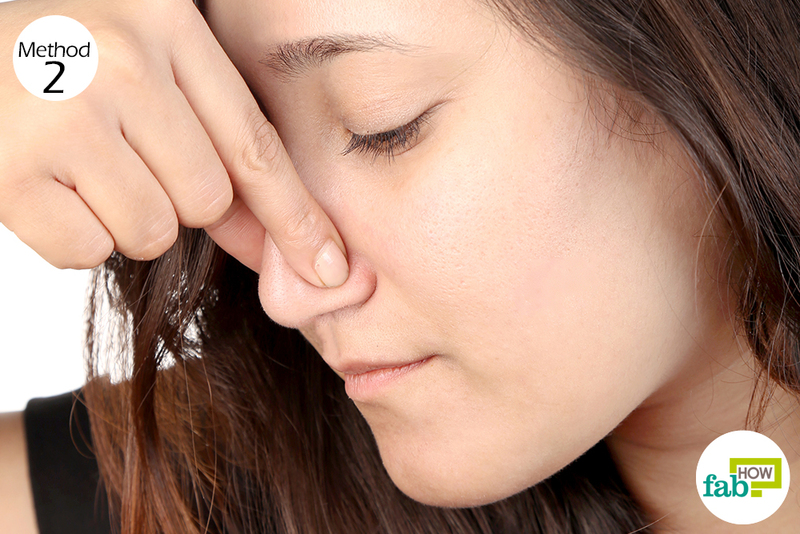 Avoid using cold and anti-allergic medication too often, as they tend to dry out your nose. The first step is to assuage the fears and anxiety of the person with the nosebleed. In the case of children, it is important to keep them from crying by reassuring them that everything is alright. Undue agitation and crying only precipitates greater blood flow. Make the person with the nosebleed sit up straight and tilt their head slightly forward. Apply gentle pressure with your finger and thumb on the soft part of nostrils below the bridge of the nose for no less than 10 minutes. Advise the person to inhale just through their mouth as long as their nostrils are pinched. If the person is wearing tight-fitting clothing, it is important to shake it loose especially around the neck such that it doesn’t constrict breathing. Apply a cold cloth or cold pack over the person’s forehead and one around the neck, especially around the sides of the neck. Having held this position for 10 minutes, let go of the pressure on the nostrils and check to see if the bleeding has subsided. In case the bleeding persists, it is advised to seek medical aid. Moreover, once the blot clots within the nasal cavity, the person will feel an irresistible urge to get rid of the condensed blood by forceful sniffing or nose blowing as well as by picking his/her nose. This kind of meddling will not allow the blood to clot properly and can even instigate further nosebleeds. Thus, it is imperative that person steers clear of sniffing incessantly or blowing their nose for a minimum of 15 minutes after the bleeding stops. He/she must also refrain from picking their nose for the rest of the day. Although nosebleeds are generally regarded as relatively common without any serious implications or causes, they can occasionally be indicative of grave health concerns. For instance, if this problem is characterized by heavy blood flow or frequent recurrence, it might be rooted in other conditions such as high blood pressure or a blood clotting disorder, which calls for professional medical examination. Furthermore, excessive bleeding over a prolonged period of time can also give way to far more severe problems such as anemia. If your healthcare provider suspects that your nosebleed is an outcome of a more worrisome health issue, he/she may refer you to an ear, nose, and throat (ENT) specialist for further tests to pin down the culpable cause. Only after proper assessment will the doctor then prescribe the appropriate course of treatment for your particular case. Nosebleeds are quite a common occurrence, particularly among children. Given this condition is not indicative of any major underlying ailment, it is rarely a cause of concern. In fact, most cases of a regular nosebleed can be easily managed and treated at home without any professional help or supervision. If your GP might order additional tests if he/she suspects that other health conditions such as hemophilia or anemia might also be at play. Nosebleeds are extremely common and not life-threatening. More often than not, it can be treated easily using simple home remedies. If the bleeding hasn’t stopped even after 20 minutes of using any remedy. If the bleeding is profuse and is draining into the throat as well as out of your nose. If you feel light-headed and/or you experience chest pain or a faster heartbeat. If the bleeding is recurrent – 3 or 4 times every week or more than 6 episodes in a month. You can use the following remedies to stop a nosebleed in less than 5 minutes. Place 3 or 4 ice cubes on a flannel cloth and bundle it up. Sit down in a comfortable position. Sitting straight will keep your head above the level of your heart and help reduce bleeding. Tilt your head forward to allow the blood to drain out from your nose. 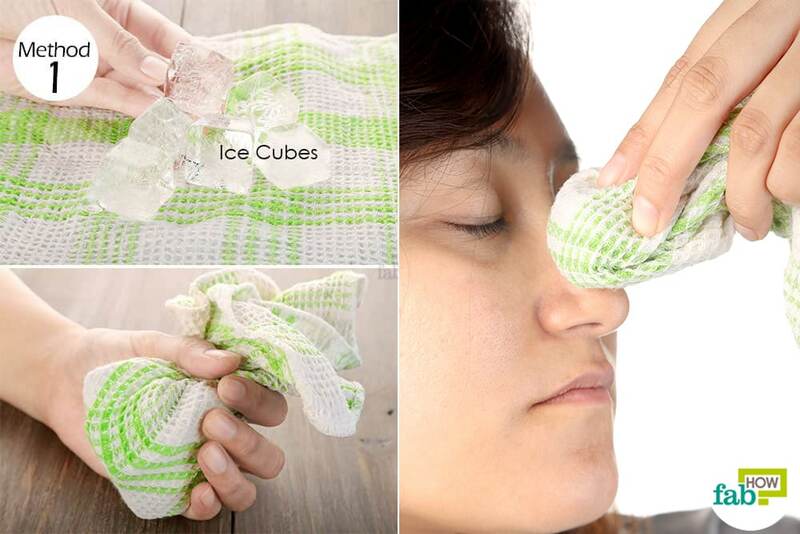 Place the ice compress on the bridge of the nose for 2 to 3 minutes. The ice compress will staunch the bleeding almost immediately. However, keep applying the compress for another 3 to 4 minutes to ensure that the bleeding has stopped completely. Using your thumb and forefinger, squeeze your nose just below the bony structure. Breathe through your mouth while you do this. Tilt your head slightly forward to prevent the blood from draining into your throat. Keep your nose squeezed for at least 5 minutes. You can also place a cold compress on your nose for faster relief. Release the nose and check for bleeding. This remedy should stop the bleeding within 5 minutes. If needed, repeat for another 5 minutes. Caution: Since it is a fat-based product, do not put it too deep inside your nose, as it can enter into the lungs and cause complications. Take some coconut oil on your fingers. Coat the inside of your nostrils to keep them moisturized. 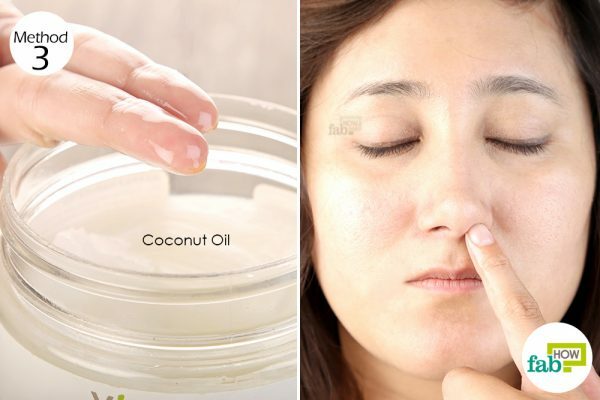 Coating the nostrils regularly with coconut oil will help prevent nosebleeds due to weather changes. 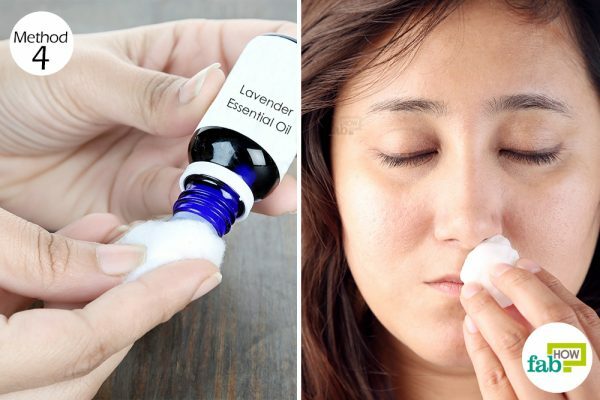 Put 2 drops of lavender essential oil on a cotton pad. Place it on the affected nostril for 5 min or until bleeding stops. The San Qi Herb used for bleeding or hemorrhage. It stops bleeding without causing stasis. (6) It has long been used in battle by soldiers to stem wounds. Take about a teaspoon of the herb powder. With the help of a q-tip, apply it to the affected nose. Apply pressure 2-3 min or until bleeding stops. Your body requires vitamin K for the coagulation of blood. Hence, eating more foods rich in vitamin K can help reduce the chances of nosebleeds. Increase your intake of green leafy vegetables and fruits, such as avocados, kiwis and grapes. If the nosebleed led to a stain on your favorite shirt, use some hydrogen peroxide to get it out. Applying a cold metal to the back of your neck is an anecdote that is vouched by many. It is said to stop the bleeding by constricting the blood vessels. The cold metal like a pair of keys is needed to be placed on the back of the neck to work. Inserting bacon up your nose is another folk remedy for treating a nosebleed. 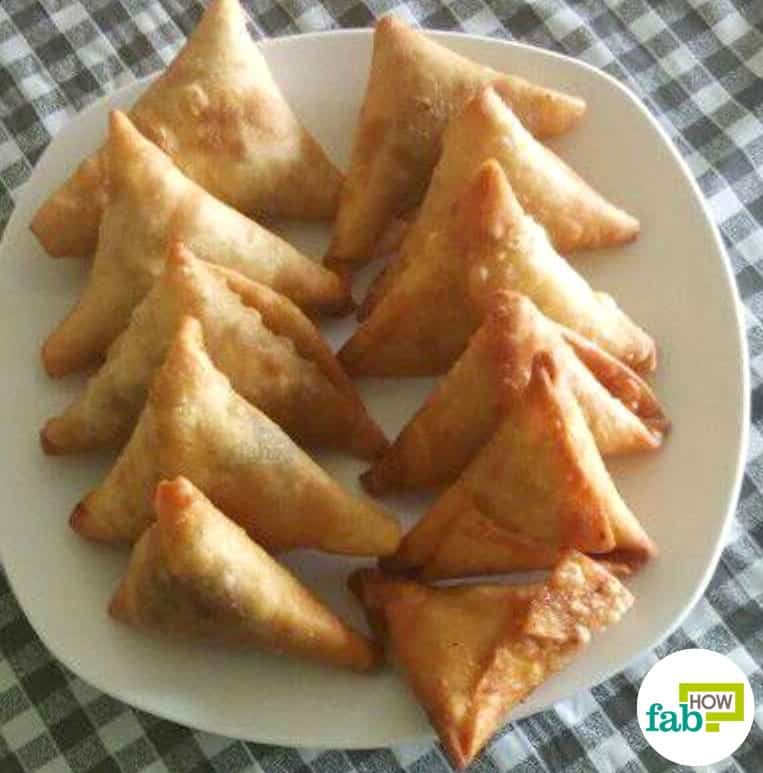 It is believed that pork contains certain properties that help the blood coagulate faster. It is especially effective for bleeding disorders. Morgan DJ, Kellerman R. Epistaxis: Evaluation and Treatment. PlumX Metrics. https://www.primarycare.theclinics.com/article/S0095-4543(13)00103-6/fulltext. Published March 2014. Pope LER, Hobbs CGL. Epistaxis: an update on current management. Postgraduate Medical Journal. https://pmj.bmj.com/content/81/955/309. Published May 1, 2005. Leong, SCL, Karkanevatos A, Roe RJ. No frills management of epistaxis. Emergency Medicine Journal. https://emj.bmj.com/content/22/7/470. Published 2005. Verallo-Rowell VM, Dillague KM, Syah-Tjundawan BS. Novel antibacterial and emollient effects of coconut and virgin olive oils in adult atopic dermatitis. Dermatitis. https://www.ncbi.nlm.nih.gov/pubmed/19134433. Published 2008. Mori H- M, Kawanami H, Kawahata H. Wound healing potential of lavender oil by acceleration of granulation and wound contraction through induction of TGF-β in a rat model. BMC Complementary and Alternative Medicine. https://www.ncbi.nlm.nih.gov/pmc/articles/PMC4880962/. Published May 26, 2016. Liang W, Leung PC, Yew DT. 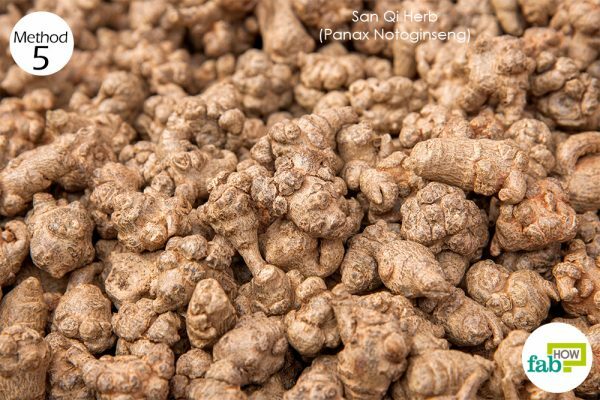 Panax notoginseng: A Double-Edged Sword in Haemostasis? Alternative & Integrative Medicine. https://www.omicsonline.org/open-access/panax-notoginseng-a-doubleedged-sword-in-haemostasis-2327-5162.1000e110.php?aid=20880. Published November 16, 2013.